Thousands rally around the globe to celebrate May Day, the largest labor holiday in the world. Amid heavy police presence, many are gathering to protest against the harsh austerity measures that have seen many Europeans mired in poverty and need. Protesters in Seattle chanted, “The power of the people don’t stop!” and waved signs that read, “15 Now” as they marched from Judkins Park to Westlake Park. The 'May Day March and Rally for Workers and Immigrant Rights' is sponsored by El Comité and the May First Action Coalition. It seeks to end deportations of undocumented workers and calls for a $15 minimum wage. Earlier Thursday, Mayor Ed Murray announced a plan to satisfy that demand by raising the minimum wage to $15 over the next seven years. Several hundred people are participating so far, and the mood has remained mellow throughout the day, despite a large police presence. The calm vibe is in stark contrast to previous years, when violence has broken out. Last year, violent clashes marked the final hours of May Day protests in Seattle, as police officers fired pepper spray and launched ‘flash bang’ grenades into crowds, leading to 17 arrests and two local reporters being pepper-sprayed. In New York City, a march led by pro-labor groups converged with marchers from immigrant-advocacy groups in front of city hall. The protesters focused on rights for undocumented immigrants and raising the minimum wage. The three main demands were to end immigrant deportations, retroactive pay for new city contracts and an increase in the minimum wage to $15 an hour. The minimum wage demand comes one day after Senate Republicans killed a bill that would have raised the federal minimum wage to $10.10 an hour. The event began in Union Square before heading to Zuccotti Park, the park made famous for hosting the Occupy Wall Street encampments. About 1,000 May Day protesters in Milwaukee, Wisc. marched to the county courthouse to call for President Barack Obama to end deportations and enact immigration reform. They also targeted Milwaukee County Sheriff David A. Clarke Jr. and Republican Gov. Scott Walker for an agreement they made with federal Immigration and Customs Enforcement (ICE) officials, where local sheriffs can hold immigrants up to 48 hours so that their legal status can be investigated. Danish protesters lashed out on the government’s policy during the May Day rally in Copenhagen’s Felledparken, saying it’s too far right and doesn’t support local workers. Around 210,000 people have taken to the streets of France, including 65,000 in Paris, according to the leadership of the General Confederation of Labor trade union, which organized the march. Demonstrators marched from Paris' Place de la Nation to Place de la Bastille, demanding that the government fight unemployment and prevent the decrease of salaries. “Unite against government austerity measures,” placards read. Another rally was organized by France’s Democratic Confederation of Labour at Place de la Bataille-de-Stalingrad in Paris and called on the EU to take measures to battle unemployment. Union leaders and 200 activists then laid wreaths at the Communards' Wall in Père-Lazesh. In a third rally, National Front leader Marine Le Pen slammed the EU for “deindustrializing France” and “destroying the country.” Le Pen urged France to “restore” its borders and exit the Schengen Area. According to her, 22,000 people took part in the rally, though police said there were no more than 6,000 people in attendance. Several hundred people from the Communist Party of Armenia held a rally in Yerevan demonstrating in favor of Armenia’s accession to the Customs Union created by Belarus, Kazakhstan and Russia, Itar-tass reported. The people marched towards the Russian Embassy, carrying Soviet-era flags and placards and chanting "Russia, Russia!" 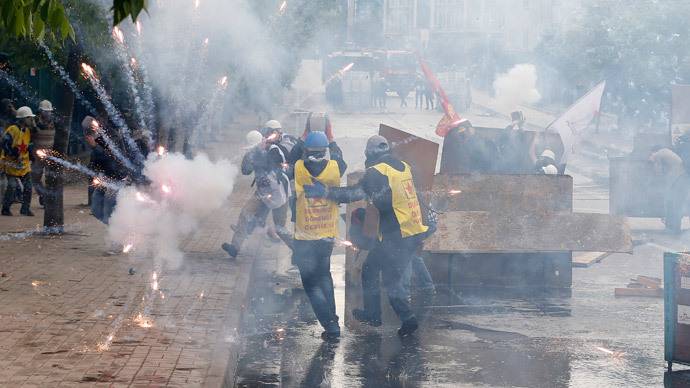 142 demonstrators have been detained and 90 people, including 19 police officers, were injured in the Turkish capital of Istanbul, said the local governor’s office in a statement, as cited by the Hurriyet Daily. Twenty-three people are still being treated in hospital, the statement added. The figure includes only those treated in hospitals and does not take into account those who have been treated outside. Dozens gathered near the Iraqi Communist Party headquarters in downtown Baghdad for a May Day demo in Iraq. Most of the demonstrators were party members. They raised Iraqi flags and those of the former Soviet Union. In the Malaysian capital, thousands gathered to protests against the growing price of goods and 6 percent services tax that will be implemented from April 2015. The people fear that the tax will increase the cost of living, which will further burden the poor following last year’s cut subsidies on fuel and electricity. The rally is a clear message that people are against the new tax, “which is only going to make the cronies richer,” said opposition leader Anwar Ibrahim. In Iran thousands gathered in Tehran to celebrate Labor Day as President Hassan Rouhani addressed workers saying he supports the establishment of unions free from government control.